AZUSA, Calif. – Aug. 12, 2013 - Northrop Grumman Corporation's (NYSE:NOC) Azusa campus recently concluded its year-end activities for the company's High School Involvement Partnership (HIP) program with its ninth annual engineering competition and an awards dinner. The Northrop Grumman HIP program is designed to encourage students interested in science, technology, engineering and mathematics (STEM) fields and support their pursuit of technical degrees. This serves the long-term goal of developing enough scientists and engineers to meet future industry employment needs. "The HIP program provides students an opportunity to explore their interest in engineering by working with Northrop Grumman mentors and applying these principles to design and build a product capable of performing specific tasks," said Stephen J. Toner, vice president of the Military and Civil Space business unit at Northrop Grumman's Electronic Systems sector. "This will help form a strong foundation to build upon as they pursue careers in technical fields." 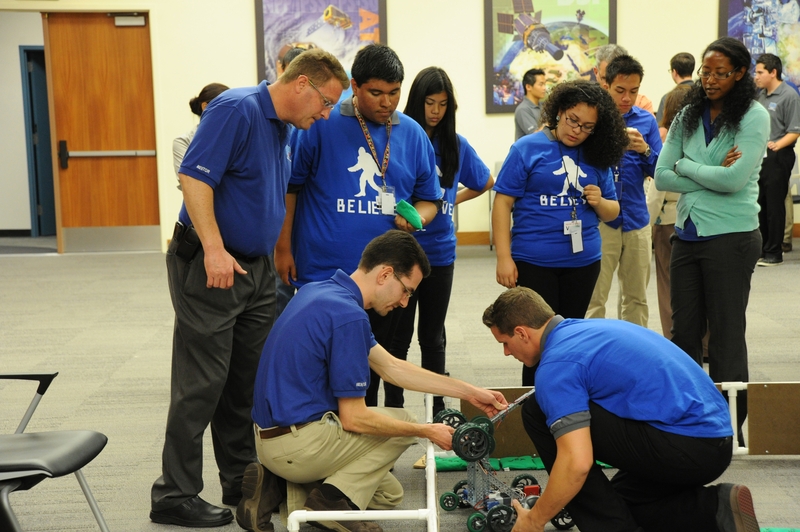 The HIP competition challenge involved students from Azusa High School and Gladstone High School assisted by Northrop Grumman employee mentors. Four teams totaling 17 students and 14 mentors competed in a robotics competition. The objective was to place bean bag sacks in the team's five goal locations to score as many points as possible. The winner was Team Sasquatch with students from both schools. "Gladstone High School is grateful for the opportunity for our students to participate in Northrop Grumman's HIP program," said Keven Gayton, assistant principal of Gladstone High School. "Our recent graduates have expanded their knowledge, communication and teamwork skills from this worthy partnership." "Northrop Grumman has been a great partner with Azusa High School for several years," said John Steven Coke, Sr., principal of Azusa High School. "Every year, we are honored to have our students work with mentors to encourage greater achievement in engineering. HIP is truly a great crosstown partnership." At the year-end celebration dinner sponsored by Northrop Grumman, the HIP students presented overviews of their projects and shared lessons learned during the program. Along with recognizing the HIP students, this year's recipients of the Northrop Grumman Engineering Scholars awards, Lucas Del Toro and Chandler Woo, were honored. Students who successfully complete the HIP program are eligible for a partial college/university scholarship for four consecutive years. Scholarship requirements include full-time enrollment in an accredited academic program in engineering, physics, computer science or mathematics and maintaining a minimum grade-point average of 3.0.